After running a quick format on the Patriot Blaze 240GB, it is back to the races with this SSD, and quite literally too. 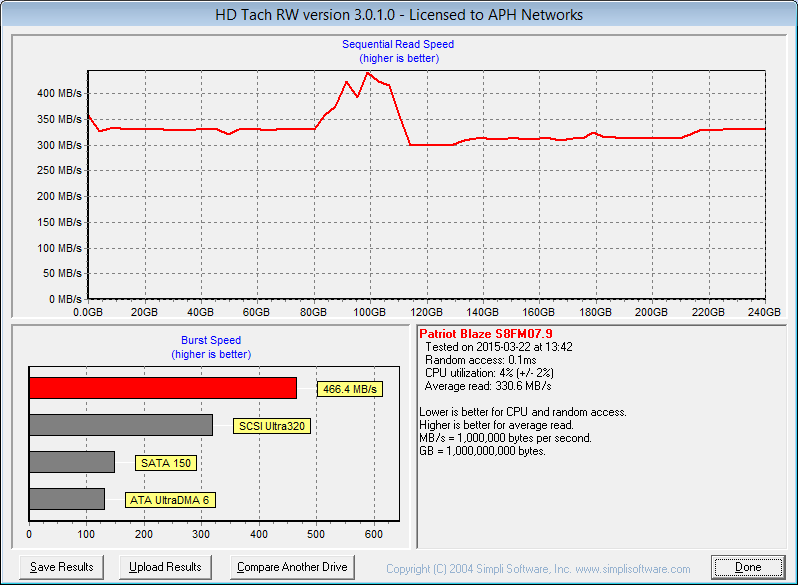 HD Tach is more of a 'drag race' approach to testing storage devices, and it has been around quite a while. This kind of behavior does not reflect real life performance, but instead is more of a synthetic situation. However, HD Tach has been a favorite among our testing suite, and thus it makes its appearance once again. Looking at the results, we can see a generally flat line across the graph. With an average read speed of 330.6MB/s, this result is much lower than the SanDisk Ultra II by around 130MB/s. On average, other drives we have tested rate around 350MB/s, so the Patriot Blaze 240GB is slower than average. At the end, while these testing methodologies may not be most suited for solid state drives, the numbers are interesting nonetheless. posted 16 hours and 45 minutes ago, with 9 posts. posted 21 hours and 14 minutes ago, with 9 posts.